Letting Go – 4 Healthy ways to cope with breakups. Relationships can be some of the most exciting opportunities to know and to be known by someone. However, when they end, they can be a great source of hurt, pain, excitement, fear, and so many other emotions. Letting go of the relationship is hard no matter the circumstance. In some cases you may get general closure or in others, you may never know why. You may call out to God and ask, “Why?” with the only answer that he is close to the brokenhearted. The reality is that no one person can listen, talk, or sympathize enough to provide any long term emotional, spiritual, or physical relief. It takes an infinite God partnered with your journey. If you find yourself in that situation today, you have a great opportunity to deal with it and move past the hurt. If you do not deal with the pain, you will carry it forward and it will come back to bite you. There are four quick start things you can do to move past the hurt and to foster daily peace. What you think about, you bring about and those thoughts manifest as feelings. The more you center your thoughts on the pain, the loss of the dream, or breakup, the more you move yourself toward negative feelings. This can be very confusing to you as there are so many thoughts interrupting your daily life of what-ifs and wishes. You must start to secure that area of the mind so that you can once again bring good thoughts of a hopeful future. My best friends and I often talk about reality and fantasy. The reality in this case is that the relationship has ended. The fantasy would be to continue to dream about the what-ifs. Since God is the originator of hope, and we are built in his image, we are often hopeful. So many times, we as Christians petition for God’s help, making promises that we cannot keep, for dreams that are not in his will. There are exceptions where God may step in and save something, but when he does not we often refuse to accept that and move forward. I have seen many divorcees sacrifice themselves on this principal, not realizing that sometimes the breakup ends up being a better plan for you than you would have ever dreamed. This can be difficult to swallow as your pastor’s stand in front of your congregation on Sunday reading prayer cards of the exceptions, while your heart is shattered. You must center your thoughts so that you can accept the reality while still trusting in God and his timing. David had a great way of telling God the way he felt but then expressed thankfulness. A reminder of God’s character and unfailing love and his trust in it. “But I trust in you, O Lord, I say, ‘You are my God.’ My times are in your hand…” (Psalm 31:14-15a). Know that 90% of what you are going through is in your mind and your thoughts battle for control of everything else in your life. God has so many more resources than we do. Ask for them. God encourages us to talk to him being fully open and honest. He also calls us to leave the pain behind. Bring it into his presence; he welcomes us no matter what our baggage is. You may be so weary and you can’t even push yourself to move to talk to God. It feels like a gigantic wall that you can’t get over. However, by centering your thoughts on God’s word will enable your talk to follow. Anything worth embracing comes with a cost. The pain of the heart is only a sign that you participated in the journey and that is a beauty that is often overlooked. Many people walk through life never feeling, blocking the hurts of the past never fully being able to truly give of themselves. They don’t live life to the fullest embracing the risks and failings as well as the victories. Nor make peace with the pain without the audience. They only waste precious time and energy musing over the “why’s,” not allowing the mystery of life to teach us that the valleys are necessary to give us true joy on the mountain tops. I have found that when my heart hurts the most, God is close to my brokenness and brings healing. It’s amazing to think that he cares so much to hold us so close and care for our heart. “The LORD is close to the brokenhearted and saves those who are crushed in spirit.” Know that he is close to your heart and center it on him. Pain requires you to make peace with it. It is dealt with when we take responsibility and refuse to blame others. When we maturely acknowledge that some of our own choices have caused our pain, we can understand that our future is also determined by better choices. We cannot go back to wishing that we had done this or that, as it will not change the future to remove any pain from your heart. The only thing that truly eradicates the pain is the gratefulness of knowing that God gives us second chances. Making true peace with the pain requires gratefulness for that journey. We have all been hurt by other people’s actions. The only peace for us is to resolve in our hearts to be forgiving and thankful that we have a God who heals and redeems. Gratefulness takes the focus off the pain and puts it on the journey ahead that the God of the Universe is leading us on. The more we own our part, the more we can joyfully look for his restoration. If you have gone through a breakup, know that God is close. If you center your thoughts and heart on him, while taking responsibility and choosing gratefulness, you can start to see the light of hope and peace that awaits you. Your mind and thoughts may battle for that peace, but if you choose worship and trust in God, you will win that battle. 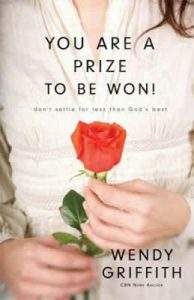 If you are struggling with this right now, and need resources I suggest you read Wendy’s book “You Are a Prize to be Won.” She has some powerful words of encouragement written in the light of her experiences and there is no teacher like experience.